I wrote out what each of my kids like for meals and snacks. This is good to do when you start feeling stumped as to what to feed your kids. It’s also a good list to give to Grandma who might take your kids for the weekend. This does not include what my kids might take for lunch to school. I’ll do another post on that. My oldest does Feingold only and limited dairy. 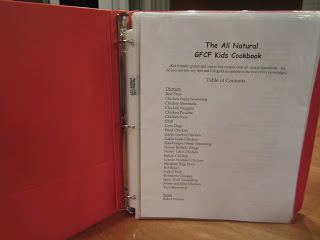 My younger three are GFCF (gluten and dairy free) and peanut free. I have one that is also egg free. 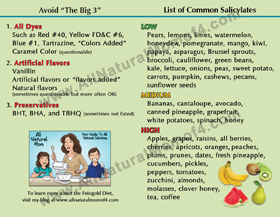 Each of my kids have varying sensitivities to salicylates, and my daughter also does a modified low oxalate diet. We are not strictly stage one due to other food allergies, not because my kids don’t react to a lot of salicylates. They also have their own preferences when it comes to food. So, that is why I have these all listed out by child but you will find some of these foods repeated. 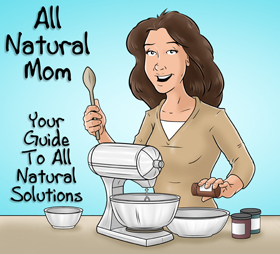 Recipes are listed on my recipe blog, All Natural Recipes. If you are a Feingold member, please check your shopping guide to double check any brands I have listed. Ingredients can change at any time, and as well, we use some products that are not officially approved but that we use without problems. Most of them are from manufacturers that refuse to fill out forms or just haven’t been approved by Feingold yet. Use at your own discretion. Grilled chicken (sprinkle with garlic salt before grilling) with U.S. Wellness BBQ sauce. with Daiya cheddar cheese and lettuce and 1 tomato wedge diced. (order from above) with U.S. Wellness BBQ sauce in a bowl. butter, peas, green beans, Brussels sprouts, asparagus. cheese. See recipe. Tinkada noodles. cheddar cheese and Rudi’s gluten free Original bread. lettuce on Food for Life brown rice bread. Hormel Natural Oven Roasted turkey. sometimes mustard, chopped onions, and Daiya cheddar cheese. – sometimes wrapped in turkey slice. Orange (only one per day). occasion – only one per day). (the big round ones) on occasion. Not too often or too many of these. cracker cookie and animal cracker cookie mixes. Order from www.allergygrocer.com. – GFCF and egg free from Swirls Bakery. Yellow cupcake with vanilla frosting. Send these for b-day parties. These have soy. though. We try to avoid. Delicious vanilla coconut milk ice cream to root beer. replacer). He puts soy free butter on and sometimes garlic powder. chips (Woodman’s). Use 2 tsp of seasonings. See recipe. Won’t eat if too spicy. made with Fritos (see recipe). sauce (see recipe). Tinkyada GF noodles. cookies (the big round ones) on occasion. Velvet. Send these for b-day parties. These have soy. strawberry frosting (On occasion) See recipe. with a little water added. Will drink ice water at night. pop or 365 Root Beer. Only 1/3 of the can, on rare occasion. Tillen Farms maraschino cherries and juice added to Sierra Mist on occasion – little bit. cereal with coconut milk and little honey. Various soups – same as L.
grilled cheese. Same kind as L’s. with broccoli (sometimes). Add pieces of GF bread to it. above). No bananas or apples. Gets constipated and hives. replacer). She puts soy free butter on and garlic powder. with parmesan cheese (Meijer brand). brownies (indiv wrapped in a box – these have eggs. rice krispy treats (see recipe). too many. It has xylitol and can cause diarrhea if they eat too many. Suckers – Yummy Earth – reserved for parties if at all, not every day. double stack with no bun or cheese, only lettuce, tomato, onion, and ketchup. Fries for C or baked potato, and hamburger. sheets or use Bounce Unscented dryer sheets. shampoo for D. C can use either. above can be found at www.feingoldrecipes.blogspot.com. B). Order directly from www.elementalsliving.com only. Infant probiotics – give her about half the recommended dose (about 1/8 tsp). Order from www.elementalsliving.com or directly thru Klaire’s. Detoxification Support – order from same place as B’s. oz each of magnesium Water Oz and Calcium Water Oz. Allerase for veggies or fruits. Lypo Gold for high fat/meats/greasy meals. Digest Gold for everything else. shot glass with dinner with 1 drop of vitamin D.
Whole Foods on hand for any earaches. for low fevers. Give 3-4 pellets two to three times a day. extra strength for C for headache. fungus/rash/warts. Dilute 1-2 drops of oil with 3 drops of water. Posted in Feingold Diet and tagged Feingold Diet Info, GFCF Diet Info. This is very helpful, thank you. 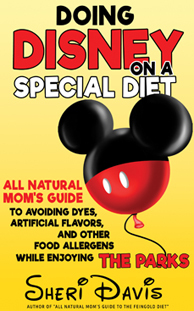 Our 4th (now about a year and a half) seems to be the one driving us down the path of natural eating with big dairy issues, and bouts of crazy insomnia that we are seemingly now tying into dyes … so we're going to attempt this path and feel good about it regardless due to it's natural foundations. Blessings! Hi Matt. Glad this is helpful! My kids reacted the same way when they were babies! They did not sleep well at all if they (or I – b/c I was breastfeeding) ate dyes or artificial flavors. My 4th child sleeps so much better than my other kids did. I never fed her any dyes but I finally figured out that if I ate dyes (not that is was often), it would affect the baby too. Good luck! You won't regret it. Your site has been extremely helpful. 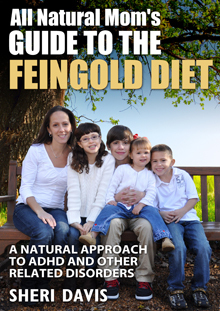 I have been looking into the Feingold diet after it was suggested by my son's (6yr old) teacher (at an alternative program where he got kicked out of school). I tried to impliment it this week, but have already ran into loads of problems and it is only Tuesday 🙁 It just seems that I can not get the support I need. I made breakfast before he went to school, and packed his lunch and snacks. I even told the teacher and principal what was going on, and of course told him, but he ended up coming home with cookies from who knows where and then after school they gave him snacks and things (though he had packed snacks and I did let them know). I am feeling a little defeated already. Any suggestions? Hi Brandy. Sorry to hear about your school. I would raise heck about this. Have you put anything in writing to the school about diet, etc.? If not, I would do so now even tho you have already done so verbally. Does he have an IEP or a 504? Have them write it into that for sure. I have a sample letter here on my blog (Letters To Teachers). I would word yours a little stronger maybe and just reiterate that he is to get absolutely nothing at school. He should only eat food that is brought in from home, period. Unfortunately, sometimes they will still go ahead and pull stuff like this. Every time, send an email about it. Next time you are at the dr., tell ur dr about the diet and how it is helping your son with ADHD issues. See if the dr will write u a letter too. If not, you don't need it, but its nice to have to try to get the school's attn. Before every class party, I also send an email reminder to the teacher too. Also leave a bag of snacks/treats w/the teacher for days where they have unexpected treats. Hang in there. Don't let other people's ignorance get in the way of doing what is best for ur son. Thank you for that. I am feeling better and I have a plan now. We are having a 504 meeting at the school, so I hope things will go better after that. I am also contacting his doctor to see if I can get something from him for the school. Oh good. Hope that takes care of things. Once it's in the 504, they can get in trouble for going against it. That will usually get the teacher's attention – hopefully! Good luck at the meeting. God Bless you! We have been following the Feingold diet for over 10 years but I never thought to type it all out like that!! Makes so much sense! Such a help to think it through once and then refer back to it whenever you need to.